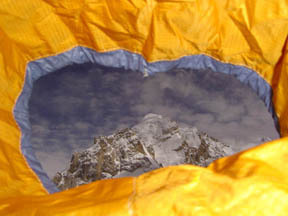 Kedar Dome East face expedition (post-monsoon 03). Summer's Monsoon still firmly enforced its presence throughout our Indian travel, all the way up & into the high valleys of Garhwal's Himalaya. From the plains our expedition traversed to the River Ganga (Ganges) and followed it upstream to the glacial source: A very special Hindu pilgrimage. 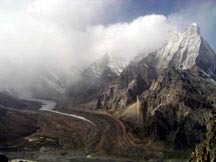 Their destination the glacier's snout, source of the river's flow "Gaumukh" (Cow's Mouth): Bathe and return home with a bottled memento or perhaps travel further; onto the Gangotri glacier and up to its first alpine meadow Topovan, immediately beneath Shivling. Ganga has remained in the Indian psyche as the ultimate source of attaining nirvana and every important place along the Ganga has become major pilgrimage centres for millions of Hindus. 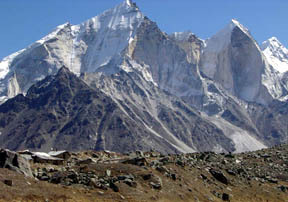 Gangotri is the place where the Ganga is believed to have descended on earth. India's well developed roads grant rapid access to high elevation compared with neighbouring countries; the old mark of Imperialism stamped this great network into some truly rugged regions. Gangotri being one, same name applies to a 10000ft town wedged into a steep sided 'V' shaped river valley host to temples, Ashrams and pilgrims unable to journey further on foot. The Ganga river & Gangotri glacier valley's are known as Devbhoomi, Land of God. 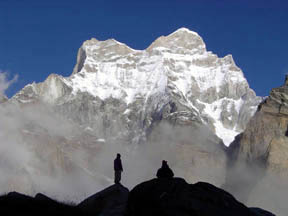 Gangotri and Topovan reflects this with a small population residing the summer season in caves, tarp shelters or crude huts while engaging their religious journey. Indulging much further than simply collecting water. One Babu has remained in Topovan's strip of 14500ft meadow for thirty five years, without even heading down-valley during extreme winters. This same meadow host those desiring Shiviling or Meru's summits. 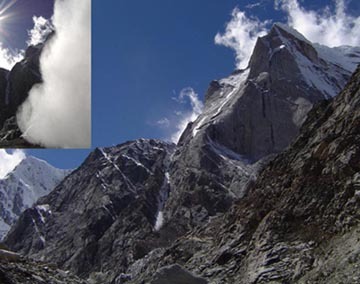 (The two images right are Shivling (21600ft) from Topovan and (below Left) Bhagirathi II & III (22300ft-ish)). Our intended camp lay beyond Topovan yet we opted for a couple of days acclimatizing, bouldering and the company of Conrad Anker, Bruce Miller & Doug Chabot before auguring into our own base-encampment. Travelling under an eternal grey ceiling kept all vistas veiled until Topovan's breathtaking cloud lift. 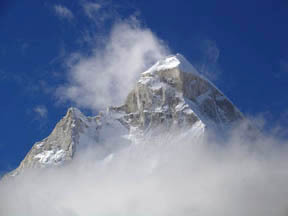 Rime ice cloaked the Bhagirathi group and Shiviling's conical form after such prolonged, incessant weather. The American trio's hopes rose with the frowning cloud's that had darkened their entire stay and quest for Meru's Shark Fin. Tardy arrival of the year's monsoon created many problems for India's population, its lingering proved the same for climbers in greatly foreshortening the "Post-Monsoon" weather window. Another unfortunate and temporary side effect of travelling to Asia's mountains always seems to be loss of appetite for Rice & Curry dishes: Usually a personal favourite but too much is just that, specially after the inevitable violent ejection from one's body; at least once per-trip? Unfortunately companions Mark Synnott and Cameron Lawson were suffering but recovering from their intestinal demons yet still managed to enjoy 'world-class' granite bouldering in Topovan meadow. So good I know a couple of folk who have made the journey with no intent beyond boulders. Sundovan three hours 'up valley', the next meadow/bench hovering above the Gangotri glacier shared little physical character with its namesake "Beautiful/Mystical Forest" and was to be our base. 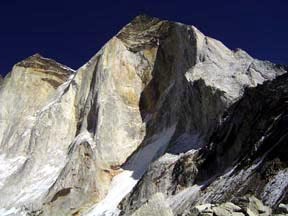 The North ridge of 22600ft Kedar Dome rolls right down to camp's plateau, the Bhagirathis loom across the Gangotri and Shivling stands proud to the North beyond the Kirti glacier: Doubling its summits viewed from the new southern aspect (image right). Kedar Dome's previous trundling of perfect quartzite boulders onto a flat sandy wash behind camp provided fun and exercise maintaining fitness during uncompromising afternoon storms. Finest of the small stones was dubbed "The Five Star Boulder" and would be big news if adjacent to any urban area, each passage a multi stared classic, every landing flat sand; V0 to V8 and a remaining V11 project. 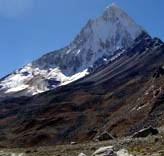 Our true intent Kedar Dome is adequately described in Jan Babicz's Peaks & Passes of the Garhwal Himalaya:" The massif seems to be most interesting from the side of the Ghanohim glacier above which rises, the only of this kind, monolithic East face of Kedar Dome. It probably constitutes the biggest Alpine problem in the Gangotri region". 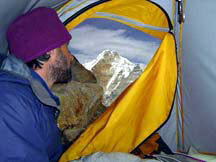 Our adventure lay on this East face, advanced base-camp was placed on the Ghanohim beneath the 7000ft facet. Alpine style was the way we approached the project: no fixed ropes everything necessary (stove, tent, sleeping bags, food n' fuel) carried on one's back up each pitch. Style is important in Alpine climbing, the uniform opinion of practitioners is that 'Alpine Style' offers a pure challenge and that fixing rope with a large team is a fine way to ensure a better result but rather 1970s in thinking. In preparation we travelled part way up the Normal (N side) route and bivied around 18000ft to further acclimatize. Having witnessed the entire innocuous looking slope shed a snowy layer in an avalanche leaving nothing unscathed; we had no desire to step above the line of shear which traversed a half mile of slope just below the summit. Conrad & co, left toward the end of September Cameron along with them: A fierce rain storm brewed and released, its duration almost timed to perfection dowsing those walking back down to the town of Gangotri. Their departure also brought an immediate shift in climatic gears, afternoon storms became limited, in fact they were limited to the immediate vicinity of Kedar Dome's East face? The peak greeted advance base-camp arrival by spitting a chunk of ice from the summit's serac barrier (just right of the rock summit, image right) resulting in a blast of snow pellets (inset image, couloir is visible in both images for reference): Of course our equipment was laid out for packing and inventory at the time; luckily no large debris. Intent was to climb directly up the lower buttress (left of the visible couloir), traverse the ridge to the upper pillar which would be climbed on the left side of the skyline. Seven thousand feet of elevation gain and what looked to be at least ten thousand climbing feet. The first day didn't offer up anything very technical, eighteen hundred feet of elevation gain. 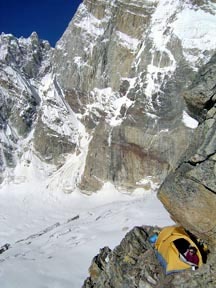 Two rope lengths breeched the bergschrund and initial rock band gaining a system of grassy ramps that finalized with several mixed pitches and onto a snowy terrace. We soloed the mixed climbing and set up the tent as the ridge adjacent to Kedar Dome began spewing large dark cumulus clouds. Devoid of energy from grovelling with sizable loads snow flurries forced shelter and brought a very welcome break, though short climbing day. Snow relented as wind reached worrying speeds then dead calm, a clear brightly starred night sky. Morning sun quickly dispensed yesterdays fresh fall but the cumulus gained strength early during the second climbing day. By afternoon we were pinned by a fresh snow layer coating rock pitches, again the flurries relented by evening. Repetitive storm syndrome still remained localized to the ridge dividing Kedarnath's east & south faces: Every day around eleven am the cumulus would build on the ridge dowsing Kedarnath and Kedar Dome but nothing more? Day three on the climb daw ned to a murky sky, cloud filled and was showering by nine am. Only four pitches had been possible the previous day, free climbing up to 5.9/5.10- with sparse protection. Day three passed tent bound trying not to delve into food rations. Day four offered little more promise, we stashed the tent, food & fuel at high camp descended, leaving further equipment mainly rock gear, above the mixed pitches at the first bivouac site. The idea was to re-supply food and wait for a higher pressure weather system to force out daily storms. Snow early each afternoon and the morning melt cycle minimized climbing time and frankly, we needed more usable hours each day to pull off such a lengthy objective. Afternoon build-up won the game a further week followed by a rise in barometric pressure, the highest thus far: All the signs needed to pack up and return to the climb. The most violent of rime ice spraying storms initiated as if triggered by arrival back to advanced base. Morning sun succeeded its melting task as we returned up the ramps and mixed terrain, en route with the mindset that we had to beat building clouds and gain the prior high-point. Cumulus began fluffing the ridge as usual but without expected vigour, receding instead of releasing in the afternoon. Regaining the prior highpoint in a single climbing day boosted psyche: Leading was divided into blocks instead of switching packs and racks each pitch. Front man proved the easier task, jumaring beneath the 60-70lb pack was much more physi cal; absolutely draining more like, yet we stayed in motion. Our second climbing day saw minimal cloud building, the pattern had broken! Several hundred feet of simul climbing, two steep rock pitches following good, protectable crack systems then a lengthy traverse to a couloir/gully. Mark lead up the gully trailing our two ropes; a 60m, 10mm diameter lead rope and a skinny 7mm, also 60m. Mark placed a belay and anchored the main rope on the right side of the gully removed his pack and clipped it to the belay; he then continued up the remainder of the gully trailing th e skinny rope while I jumared the 10mm up to the belay. The belay consisted of three cams in what looked to be perfect cracks, I was walking up the snow pulling on the rope for motive power, my full weight not upon the belay: Then a moment of weightless-ness, first realization came as I rotated, head down under the pack's mass, jumars flapping yet still attached to the now slack rope, instinct without processing had me flip onto the pack in the hope its odd shape would add friction and stop my slide. This worked, until Mark's pack overtook my slithering form pulling further down slope. When the anchor failed I fell left as the block that was the belay rolled down the right side. Dramatics ceased, I was completely unscathed. Packs were clipped and being hauled, Mark still apologizing, the blocks brief meeting point with our main 10mm rope was glaringly obvious. A fluffy white patch of protruding core; as per "Murphy's Law" it was immediately beside the rope's half way mark. Three and a half thousand feet lay beneath and the same above; the rope had put us out of the race and could still make descent problematic. 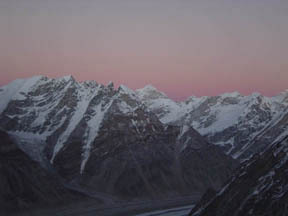 A bivouac was taken atop the ridge and descent the following day. Weather shifted once more, firmly delivering autumnal conditions. Cold (-20 to -30°C) clear nights, ground frost, a chilling wind & shrunken climbing days. Having just enough equipment and time for one quick challenge sights were trained upon Bhagirathi III's Scottish pillar (right skyline, image below/right ). Two thousand five hundred feet of granite topped by a slightly shorter shale band: El Capitan capped by a Canadian Rockies peak. Lightning the load by omitting the tent wasn't a brilliant idea worth it's four pounds in weight twice over, for projection and added warmth. Bivouacked beneath the climb we had problems staying warm and a wall of morning cloud effectively ended the venture (image left). As with any trip to the mountains we came away much wiser and with intimate knowledge of all the Gangotri valley's remaining prizes. Several unclimbed 20000ft+ peaks and numerous walls remain for the future, not forgetting Kedar Dome's monolithic pillar.